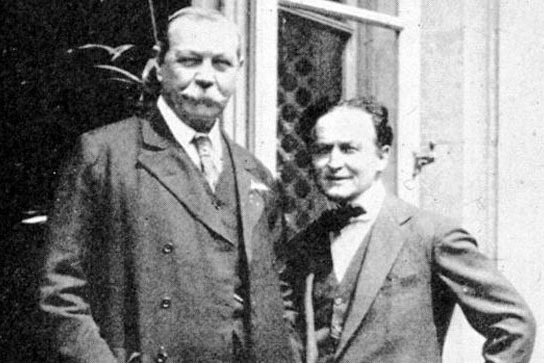 Sherlock Holmes creator Sir Arthur Conan Doyle was the early 20th century’s most famous promoter and staunch believer in spirit mediumship. If Conan Doyle had an arch nemesis, it was Harry Houdini, the world-famous escape artist turned medium-buster. So it came as quite a shock to their fans when the two men became friends. Conan Doyle was naïve to his friend’s supposed paranormal powers. Houdini was a fabulous escape artist. But he made no claims to anything beyond being a very clever magician. Conan Doyle insisted, however, that Houdini was able to dematerialize himself, despite Houdini’s assurances to the contrary. Conan Doyle, the creator of the smoothly logical Sherlock Holmes character, seemed to be without Holmes’ uncanny ability to sift through the evidence and discover the truth. Houdini, the most celebrated trickster of his time, had the training necessary to see deception where others saw miracles. The two celebrities spent many late hours discussing their differences regarding alleged psychic phenomena. Neither was swayed to the other’s side. Yet they remained friends for years. Their friendship did finally split after Doyle and his wife tried to contact Houdini’s mother in a séance which the magician attended. Mrs. Doyle, ostensibly under the influence of Houdini’s mother’s spirit, scribbled a message to Harry. Houdini was incensed. The message was in English, a language his mother never spoke. And she referred to him as “Harry,” a name she never called him by. To Houdini, this was not only a blow to his sincere desire to contact his mother – it was yet another proof of Spiritualism’s true nature. Houdini went public with the story and the two men never spoke to each other again. Houdini’s exposure of fake mediumship probably had more to do with Spiritualism’s decline in the 20th century than any other single factor. The public became wary of physical mediumship — floating trumpets, ringing bells, and materialized spirits that looked more like mediums wrapped in bed sheets. But, although its popularity was not what it was in the early part of the century, the movement continued to have a significant following even into our present time. During my Mentallusions show the audience really enjoys seeing some of the “tricks of the trade” that fooled the great author of Sherlock Holmes. Rod Robison is a mentalist, magician, author and speaker who helps companies and organizations create unforgettable events for their employees and clients. © Mentallusions, All Rights Reserved | Site Designed by Devin Hanson Design Co.